In Patricia's home there are other children whom she stays with. She is a hard working girl and social to different people at school and in the community. Patricia's health is good, and has not been hospitalized since the year began. 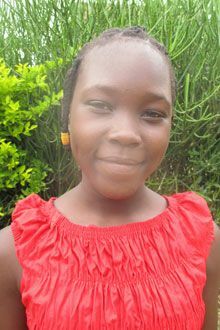 Patricia live with her parents, and they own a peace of land on which they grow crops for home consumption. Sometimes, they sell the surplus to meet other needs. The family struggles to meet basic needs such as school, health care, clothing and food. Tell your friends Patricia needs a sponsor!